We are excited to say that, after many weeks of work, multi-user and office features are now available on Edvisor.io! We’ve introduced the flexibility of having more than one office under your agency. We know that many of you have more than 1 location, or you work with affiliate agencies and wish to assign students between different offices. You can now move leads between different offices. You can create Managers for your offices. 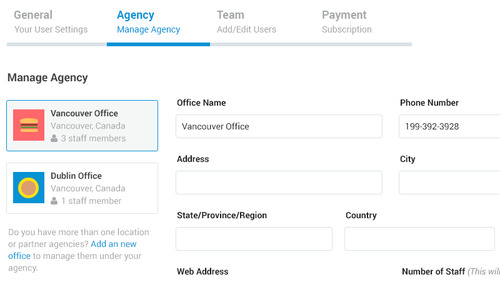 They can create and manage their own team of sales reps.
You can now add office location from your settings page. This is you, currently. 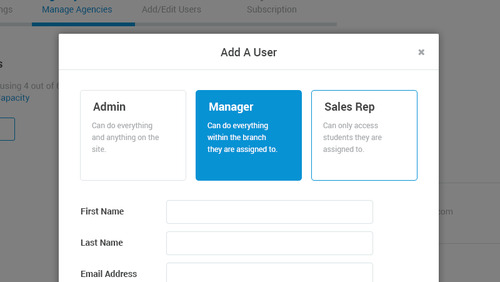 An admin is someone that can access ALL areas of your Edvisor.io account. You can have more than one admin. Admins can see all the offices, all the sales and student information, and can make any changes under the account. Managers are responsible for their assigned offices. They can only see students and sales information within the office you’ve assigned them to. Managers can create and manage sales reps, assign them students, and more. Sales reps can only work with students they’ve been assigned. They don’t see any sales or student data besides the sales they’ve made themselves. They can add leads, create quotes, and close sales, but they cannot make any changes to the office or the agency. On your dashboard you’ll notice a few more additions as well. As an admin, you can now view sales and student data by office and by sales reps, see how many sales are made and how much is earned at one glance. As a manager, you can see the data for your assigned office. And as a sales rep, you can see your own sales performance and reminders. We hope you enjoy the new additions to Edvisor.io. 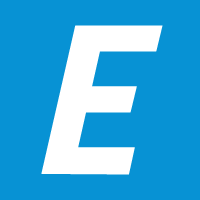 As always, if you have any questions or feature suggestions, shoot us an email at contact@edvisor.io.